There are two distinct methods for targeting striped bass on live eels. Anglers can choose either conventional tackle or spinning tackle. 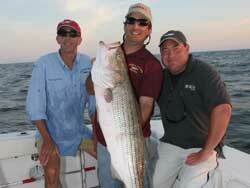 Conventional tackle is somewhat heavier and easier to fish. However, lighter spinning tackle can produce a much better presentation and will nearly always out-fish conventional tackle when there are big fish around. When drifting live eels for striped bass in fast currents, or on fast drifts when sinkers are needed, we recommend a 6’6″ to 7′ conventional rod with a fast to extra-fast action.. We recommend loading the conventional reel with 30lb braid attached to a 5ft length of 30-50lb fluorocarbon leader using a 75lb barrel swivel. The rig is completed with a 5/0 or 6/0 offset style circle hook. An egg sinker just large enough to allow the angler to keep the eel just off the bottom should be used. For catching stripers on live eels when fishing in conditions where an eel can swim to the bottom unassisted (slow drifts, shallow water, or when stemming) we recommend a 7′ spinning rod and a spinning reel loaded with with 30lb fused line attached to a 5ft length of 30-50lb fluorocarbon leader using a 75lb barrel swivel. The rig is completed with a 5/0 or 6/0 offset style circle hook. Whether using spinning or conventional tackle we strongly suggest using circle hooks. Eels are a very easy bait to swallow and indiscriminately target fish of all sizes. 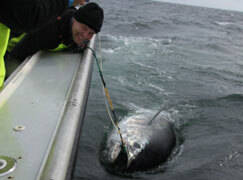 A typically day will see many undersized fish brought to the boat. The best way to release these fish is by using a dehooker at boat-side (do not net them). This will greatly reduce the stress on the fish and ensure the best chance of a quick recovery. We recommend using 30lb or heavier braided or fused lines. The thin diameter of these lines will improve the presentation by allowing the eel to dive deep quickly and stay deep. 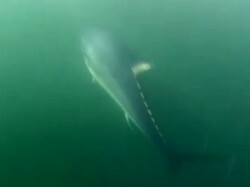 however, it is critical that the angler leaves the reel in free spool at all times to allow the striper to grab the eel and turn away before closing the bail or putting the reel in gear. No hook set is required as the circle hook should set itself in the corner of the fishes mouth. Using lines lighter than 30lb is a mistake. 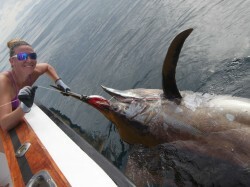 Bigger fish may be impossible to stop and the duration of the fight will create additional stress on the fish. Whenever fishing with live eels it is important to have a big supply of dry towels. Take an old big towel and cut it into many small towels and put them in a dry place. Once the towels get wet and covered with eel slime they need to be washed and dried before they can be used again. Grab the eel just behind the head and put the hook through the lower lip and out through the upper lip. Be careful not to set the hook too far back or you may kill the eel. The best spots for targeted trophy striped bass with live eels are rocky bottoms, boulder fields, ledges, and drop offs. Use your sonar unit to locate the best spots and hopefully to see some fish on those spots. 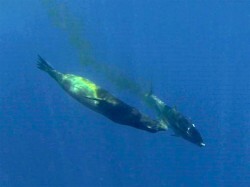 When fishing in strong current or wind assisted drift it is critical to start the drift well above the targeted bottom. This gives the eel a chance a swim down to the right depth and be in the hit zone as you drift across your target.